Make this Valentine's Day one to remember by surprising your Valentine with a special delivery from Paws! The Pawtucket Red Sox Valentine's Day Package includes Paws delivering a dozen roses to your valentine at their home or office on Wednesday - February 13, or Thursday - February 14. Paws or Sox will also bring your loved one a PawSox cap and two reserved flex tickets good for any regular season PawSox game at McCoy Stadium. Make this Valentine's Day one to remember by surprising your Valentine with a special delivery from Paws! 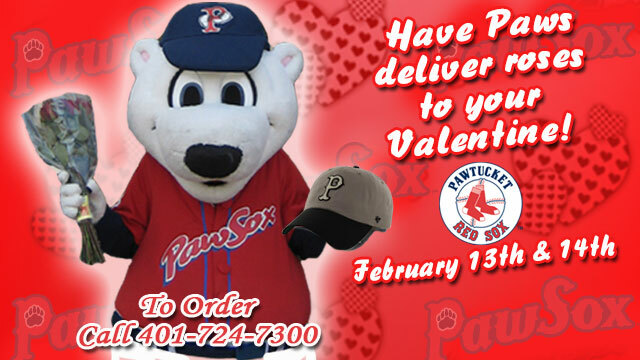 The Pawtucket Red Sox Valentine's Day Package includes: A special delivery from the PawSox mascot Paws of a dozen roses to your valentine at their home or office on Wednesday - February 13, or Thursday - February 14. Paws will also bring your love one a PawSox cap and two reserved flex tickets good for any regular season PawSox game at McCoy Stadium. Valentine's Day Packages are priced at $85.00 for one package and $75.00 each for multiple packages and can be purchased by contacting the Pawtucket Red Sox at (401)724-7300 or email the PawSox at info@pawsox.com. The Pawtucket Red Sox Administrative Offices are open 9:00am - 5:00pm, Monday through Friday.